I’ve been meaning to write about the Princess Cake at Gayle’s in Capitola, down in Santa Cruz, for as long as we’ve had our Santa Cruz food blog. This year, my family surprised me with the Princess Cake on my birthday and so I finally got a photograph of it with my new lens at 11:30pm at night before we dove into it. Gayle’s Bakery in Santa Cruz is pretty large,and when I say large, I mean 10,000 square feet of Bakery, Rosticceria, and Italian Deli. So when you get there, line up and take a number while you decide what to eat-in (fairly large patio with seating area to eat lunch) or take-home. The Princess cake is my absolute favorite birthday cake. I know I’m not alone on this one because after attending baby showers and birthday parties in Santa Cruz, I found out that Gayle’s Princess Cake is many other folks favorite cake in Santa Cruz as well. I am typically a chocolate lover, but this cake … it is truly scrumptious with a vanilla and almond paste kind of flavor with raspberry and cream inside and an unbelievable texture. Gayle’s Princess Cake Three layers of vanilla genoise cake ~ layers of pastry cream, raspberry jam & whipped cream inside ~ pastel marzipan shell outside ~ sprinkled with powdered sugar ~ topped with a fresh rose. 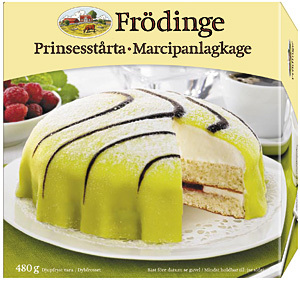 The history of the Princess Cake is that it is a traditional Swedish Cake created in the 1930’s (or as they say in Sweden, Prinsesstårta OR Prinsess Tårta). In Sweden they serve this cake for celebrations such as birthdays and graduations, just not on Christmas. You can buy it frozen as well and the brand below is suggested (check out Ikea to see if they have it in your area). I’ve read that Schuberts Bakery in San Francisco also makes a good Swedish Princess cake if you aren’t close to Santa Cruz, CA. If there were a ‘like’ button on your blog….that’s what I would have pushed….instead of writing all of these words! Yes, the princess cake is just delicious!! I love it. Will have a slice almost every time I visit Capitola! !